Brennan McAllister, a senior at Middletown High School, recently traveled to India as part of a mission that provided dental assistance to patients. 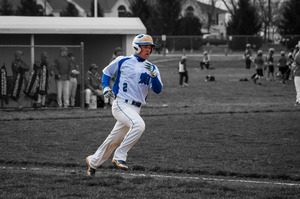 The approximate distance from the area directly behind home plate at the Middletown High School field to the northern reaches of India is 7,900 miles, but for Brennan McAllister, a catcher on the school's baseball team, the miles between his life and the life he saw for ten days this past January are measured in the people he helped. To meet McAllister is to glimpse into the life of a normal teenager in full flight, one on the fast track in preparation for his senior year at Middletown High School and beyond. A year from now, he envisions himself in college, attending class, writing term papers and playing baseball. For now, he's spending his summer as the catcher for the Delaware Diamonds, a traveling team of a high school players from the state, and he's just come back home from a seven-game barnstorming tour of the South. 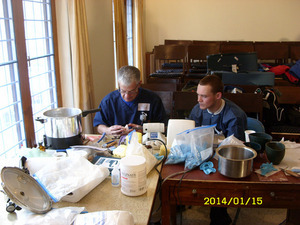 Courtesy photo On his most recent trip to India, McCallister worked with Judd Ryan, a dental lab technician, on making partials for Indian patients who sought dental assiatance. Yet, there is an experience -- or rather, a set of experiences -- in McAllister's 18-year-old life that have set him apart from most of the other teenagers seen around Middletown, life lessons learned seemingly a galaxy removed from the comfort of high school hallways or baseball dugouts. To hear him speak of these moments is to see the myopic view of most teenagers vanished, and replaced by that of a wise sage old beyond his years. He speaks of his three trips to the country of India slowly, with reverence and respect, as if someone he met there has suddenly and abruptly come to stand before him. Beginning in the sixth grade, again in the eight grade and most recently this past January, McAllister has joined his father Brian, a dentist in Middletown, as well as the rest of his family, in traveling to India as part of the Delhi Bible Institute's mission to provide impoverished individuals and families there with adequate medical and dental services. On his latest visit, he spent ten days assisting dental professionals with making dentures and partials for patients at makeshift health centers set up by the Institute. Since its beginning in 1954, the Institute, headquartered in New Delhi, has been spreading the Gospel message through its Bible teaching and training ministry. For the past 50 years, DBI has trained over 4,000 students and pastors, and has planted over 2,000 churches throughout North India, one of the most unreached parts of the world. The purpose of the Institute is to reach North India with the teachings of Jesus Christ and to serve the evangelical church in North India by training its leaders through various levels of theological education programs. The first time McAllister went, it was not by choice. Brian first went over to India in 2008 as a vision trip that first year, in order to determine what was needed in order to firmly establish the treatment centers. In 2009, stockpiled with dental equipment, Brian and other dentists and hygienists returned, only this time, the entire McAllister family joined him - his wife Cyndy and their children Brennan, Colleen and Craig. McAllister joined his father and his team in providing dental care to those who came to the campsites. In most cases, he helped clean teeth. In a few cases, he helped pull them. "My father had already been going to India for a few years, and when I was 12 years old, he called for his entire family to come with him," McAllister said. "I'm not going to lie. It was pretty scary hearing my dad's stories about the chaos of India he had experienced on his previous journeys. I was on edge, but when it was all said and done, it was a great experience." At first, Cyndy was fearful about flying her children to another part of the world. Could she open her mind to the prospect of seeing her kids walking around impoverished villages, thousands of miles from the comfort of home? "But one night at dinner, my daughter Colleen asked me, 'Mom. What are you afraid of?'" she said. "The reason for these trips stem from our faith in Christ, and by knowing that our children belong to Him, Brian and I knew that our job is to shepherd them. It's part of who we are as Christians. Brian and I saw this as planting seeds in our children's hearts that may change them for the better." If his first two journeys to India served as enlightening introductions to a part of the world he only read about, then it was McAllister's most recent 10-day visit that could best be defined as an illuminating experience -- one that revealed the state of the rest of the world to him. He saw the caste system of India compartmentalize its people into three parts: the rich, the middle-class and the impoverished poor. Those on the bottom rung of the economic scale in the United States still have access to like subsidized housing; in India, he would travel on trains and see vast stretches of land dotted with families whose living spaces consisted of lean-to shacks made of corrugated scraps of lumber. He and his family would stay at decent hotels, where just beyond their gates, he would witness poverty the likes of which he still to this day he knows he cannot adequately describe. It was as if ugliness rubbed up against beauty. "The gap between rich and poor in India is tremendous," he said. "India is not exactly a third-world country but there are parts that I saw that show exactly how it is there." 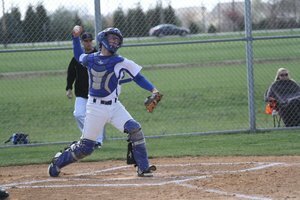 Courtesy photo McAllister is a catcher on the Middletown High School baseball team. Working with another dentist, McAllister made dentures and partials, which after their insertion better enabled patients to chew their food. As the McAllister family and the team of dentists and hygienists traveled from camp to camp -- Lucknow, Dhurdan and Ranchi -- McAllister saw the impact a lack of daily dental hygiene can have on entire villages of people which, when coupled with poor nutrition and a steady diet of sugar cane, led to massive tooth decay. "Even if they have a toothbrush, they don't even know how to use it," he said. "When you're not brushing your teeth, there's not much you can do to prevent your teeth from breaking down." Although the decimation of an impoverished and largely ignored part of the Indian population may have informed his journey, it did not wholly define it. From camp to camp, McAllister saw with amazement that the patients he and others saw would return to the camps as much as ten times during the day -- for no other reason than to thank the people who had just helped them. "A lot of the people who were treated had never seen a medical professional or a dentist before, let alone be in the company of a light-skinned person," McAllister said. "We'd go into these villages and they would stare at us as if we were ghosts. We must have looked like aliens to them. I kept thinking that America to them is like heaven, a far-reaching place they'd heard about in stories. And here they suddenly were, getting help from an American, from a part of the world that was previously unimaginable to them." There was no way McAllister could go from India back to Middletown High School and not be a changed person. How could he? Everything -- his academic work, his social life, his baseball -- it was all being filtered through a different prism of light. "I saw a maturity begin to grow in him this past January," Cyndy said of her son's most recent trip to India. 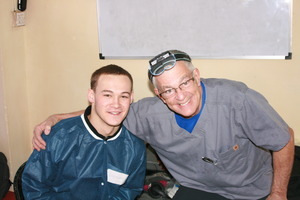 "He took the initiative on this trip to learn hands-on how to make partials and dentures, which is not surprising, given that Brennan learns best through a hands-on approach, not just sitting in the classroom and listening. Whatever direction he wishes to take in life, I know that it will be one guided by his maturity and sense of responsibility." "I wasn't surprised to hear he volunteered in India, because Brennan's not afraid to put himself out there on the baseball field," said Middletown Varsity baseball coach Scott Smith. "He's a leader, very vocal, and he rallies the team around him. Brennan does well academically, athletically, and he's just that kind of guy who people want to be friends with and coaches want on their team. "Maybe sports in a sense has given him the confidence to feel comfortable enough to put himself in an environment he's unfamiliar with, and allow him to just go after it." It may have been between games of a doubleheader, McAllister cannot recall, when he first heard that he was selected by USA Today the Army National Guard to be one of 15 high school student-athletes in the United States to receive this year's Inspiration Award, given to those who have demonstrated outstanding service to others. It's all part of what has become the magical ride that McAllister has been on since his return from India. He wants to go back there and help again sometime in the next few years, but for now, his goals are to dedicate his senior project to helping raise money for the Delhi Bible Institute through a dodgeball tournament he's planning, and then onto college, where he plans to focus on the books and baseball. He's interested in the dental industry, but unlike practicing as a dentist like his father, he's looking to pursue the idea of creating dental enhancements like molds, dentures and bridges -- items that he made in India. "What I have learned through my experiences in India is a big part of who I am becoming," he said. "Going back the last time brought the person I'm becoming to full thought. Visiting there in sixth and eighth grade were at times in my life when I was still relatively young, but when you're a junior in high school, you're beginning to put your entire life together."